Thanks to the generosity and cooperation of the museum, the station will be operated from within the London Museum and Tea Room, across the highway from the school site. 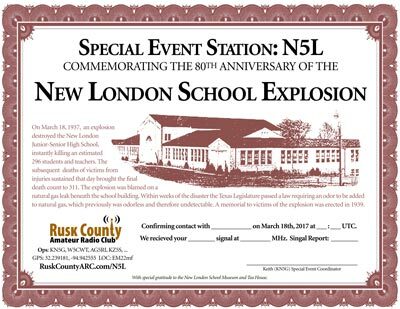 The station will run concurrently with events commemorating the 80th anniversary of the explosion. The station plans to be active on both SSB and PSK on the 40, 20 and 15 meter bands. We plan on erecting an antenna using a large tower already located at the site. 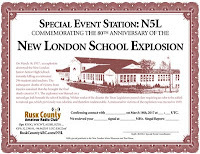 A QSL card and a Certificate will be available for all stations completing QSOs with N5L. To receive a printed QSL card, please send your own QSL card along with a SASE (at least 3.5" x 6") to "Attn: N5L QSL" and the club's address below. For a printed certificate, please send $1 and a SASE (at least 8.5" x 11") to "Attn: N5L Certificate" and the club's address below.